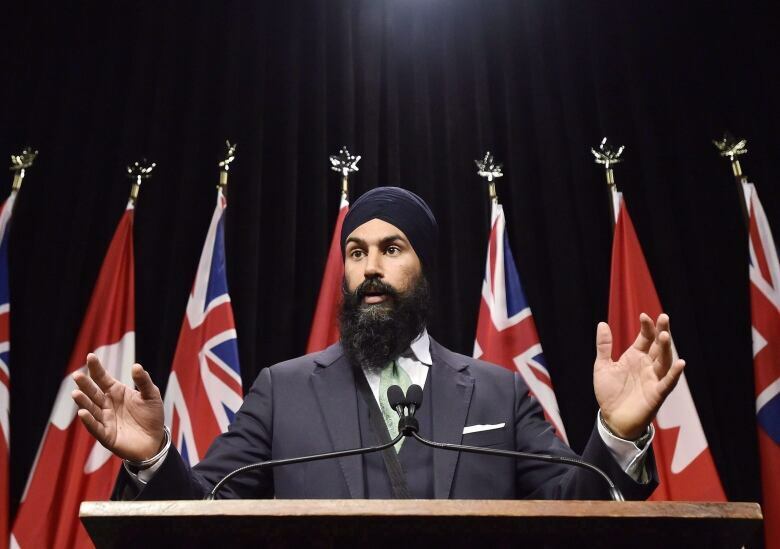 Jagmeet Singh, deputy leader of Ontario's NDP, announced Monday he is aiming to become the party's national leader, and the country's next prime minister. Singh, known for his community advocacy, charisma, and colourful turbans, said he wants to build a more inclusive Canada. Jagmeet Singh, deputy leader of Ontario's NDP, put an end to months of speculation Monday night and announced that he's aiming to become the party's national leader — and the country's next prime minister. 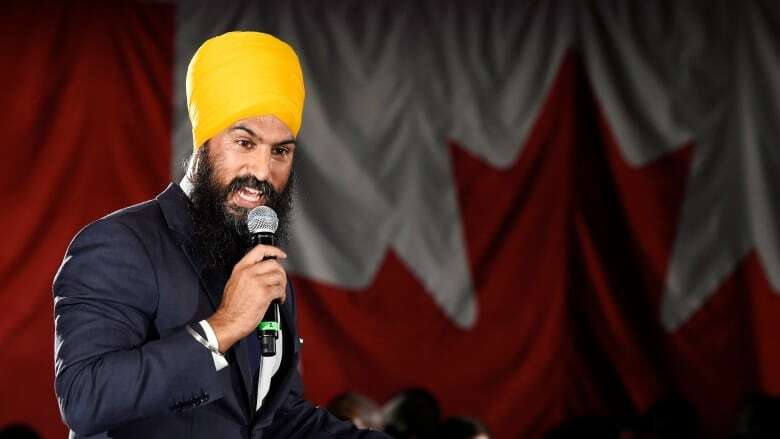 Singh launched his campaign for the federal NDP's leadership in front of a room full of supporters at the same banquet hall in Brampton, just west of Toronto, where he celebrated his first election victory in 2011. Singh told the crowd that his party, and the country, are hungry for new leadership. "Leadership that will bring people together, to build a Canada that is truly inclusive and where everyone can realize their dreams," Singh said. "That is why, my friends, today I am proud to announce that I am running to be the leader of the New Democratic Party of Canada." Singh, the first turban-wearing Sikh to sit in Ontario's legislature, told his personal story, describing how he was born in east Toronto to immigrant parents, was first raised in Newfoundland and Labrador while his father attended medical school there, and then his family moved to Windsor, Ont., when he was seven years old. Singh said he was picked on and bullied because he had "a funny sounding name, brown skin and long hair," but he learned to stand up for himself. "Nobody should be made to feel like they don't belong," Singh said. Building an inclusive Canada is what motivated him to become a lawyer, he said, and then to become involved in public life. "That's what draws me to be your leader, and that's what drives me to be your prime minister," he said. Singh took a few shots at Prime Minister Justin Trudeau on multiple policy fronts. He said the Liberal prime minister has adopted the "deplorable climate change targets" of his predecessor, Conservative prime minister Stephen Harper, and that Trudeau has a "shameful record on Indigenous child welfare." He also made reference to the other party leadership contest going on, the Conservative Party's, and said its candidates are "tripping over each other to drive a wedge between Canadians." Singh said he is offering a vision for the NDP and the country that aims to counter feelings of cynicism and powerlessness among voters. "We must champion a politics of love to fight the politics of hate," said Singh. Brad Lavigne, who was former NDP leader Jack Layton's campaign manager and is supporting Singh's candidacy, said he thinks Singh's aspirational message will appeal to voters. "I think that there is a tremendous appetite for that," said Lavigne, who was at Singh's event. "I think he's got the ability to attract people from outside of politics, people who have been turned off politics in the past." Lavigne said Singh, 38, brings energy and dynamism to the leadership race and that he is the kind of "magnet" that people are seeking. He's the party's "best chance" to gain momentum and appeal to a broad coalition of voters, Lavigne said. Former veterans ombudsman Pat Stogran and Montreal consulting firm founder Ibrahim Bruno El-Khoury are also running, but are not yet considered official because they haven't submitted nomination paperwork or paid the fee. Singh is going up against MPs with higher national profiles, and making a name for himself across Canada is one of the challenges he faces. Singh told reporters after his speech that he is confident he can connect with Canadians across the country. He said he received warm welcomes in his recent travels to British Columbia, Manitoba and Alberta. Singh delivered a good portion of his speech in French, and he is also fluent in Punjabi. He said he understands the connection between language and identity because of his parents. He respects and cares a lot about Quebec's uniqueness, Singh said, and he doesn't think the French language gets the respect it deserves. If he won the leadership, Singh would be a party leader without a seat in the House of Commons. Layton, who died in 2011, faced the same scenario and then later won a seat in Toronto. Singh said several times during the evening that Layton was an inspiration for him and personally encouraged him to beat the odds. That's what he did by winning a seat in Brampton for Ontario's NDP, Singh said, and he's prepared to do it again at the federal level. "I'm confident that won't be an obstacle that we can't overcome," he said. Several of Singh's supporters at the event talked about his energy, enthusiasm and advocacy work at Queen's Park. "He's a very compassionate and empathetic person and I like seeing that in a politician, those are important traits to have," said Harleen Sandhu, 21. Singh's also earned a reputation for his sense of style. Singh is known to wear colourful turbans and well-tailored suits. He caught the attention of GQ magazine, and when he was profiled earlier this year he said that his personal style is an extension of his political platform. His style shows his confidence and that can help disarm stereotypes about people wearing turbans and long beards, Singh said. Some of his supporters said Monday that Singh's success at the federal level would be an important achievement for the Sikh community. "We need more representation," said Sunny Manghera. They also think he is the NDP's best shot at taking on Trudeau in the next federal election. The prime minister should "100 per cent" be worried about Singh's potential arrival on the federal scene, said Rajvir Kahlon, an Oakville, Ont., resident who has supported Singh since day one of his political career, he said. Singh's decision to run for the leadership not only shakes up the race, but it also means a shakeup at Queen's Park. Ontario NDP Leader Andrea Horwath announced early Tuesday that she and Singh agreed that he step down as deputy leader and that he give up his critic roles for the duration of the race. He will stay on as MPP for his Brampton riding. Horwath wouldn't comment Monday ahead of Singh's announcement on whether she thought that was appropriate. Horwath, who named Singh her deputy leader in 2015, said Monday she's "proud" of the work he's done. 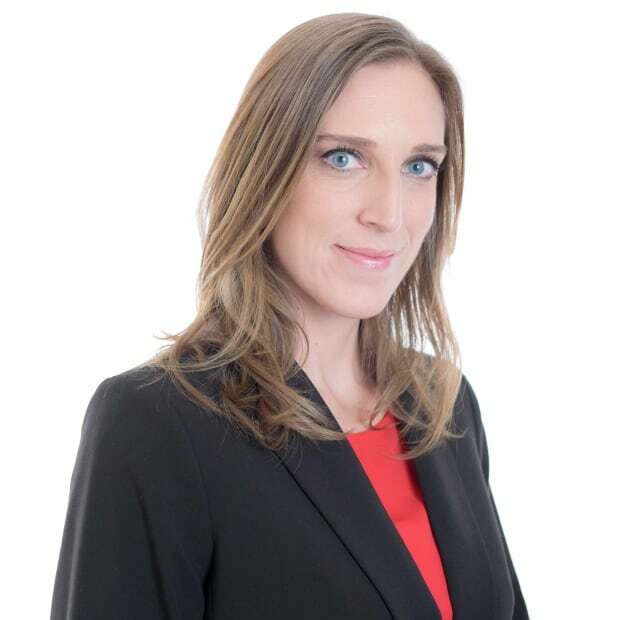 "He's been an excellent member of our team, he's done a lot of hard work to engage young people with our party, to engage folks in the broader [Greater Toronto Area] with our party," the leader said. "There is no doubt that the position of deputy leader is one that has helped Jagmeet in his work, but it's also helped the NDP and so it was a mutual relationship, it still is a mutual relationship," said Horwath. The Pollcast: When will the NDP leadership race get going?